Your customers will love the i2k Pub Party inflatable house for backyard parties, fun fairs and corporate events! They’ll feel like they’re in an Irish tavern, British pub or German brew haus with its printed roof tiles and brick walls. 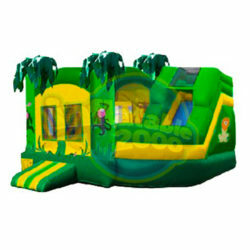 You can also customize the theme of this inflatable house with one of four removable banners. This inflatable house makes a spectacular addition to college events, birthday parties, block parties, fundraisers, Oktoberfest celebrations and more! Includes (2) Banners Inflator Repair Kit Storage Bag Stakes. Dimensions: 15′ x 20′ x 16′ 4″, Weight: 285 lbs.